I don't often reread books. And if I do, I wait at least three or four years in between. I've always been a very slow reader, and maybe because of that, I tend to remember the things I read pretty vividly. 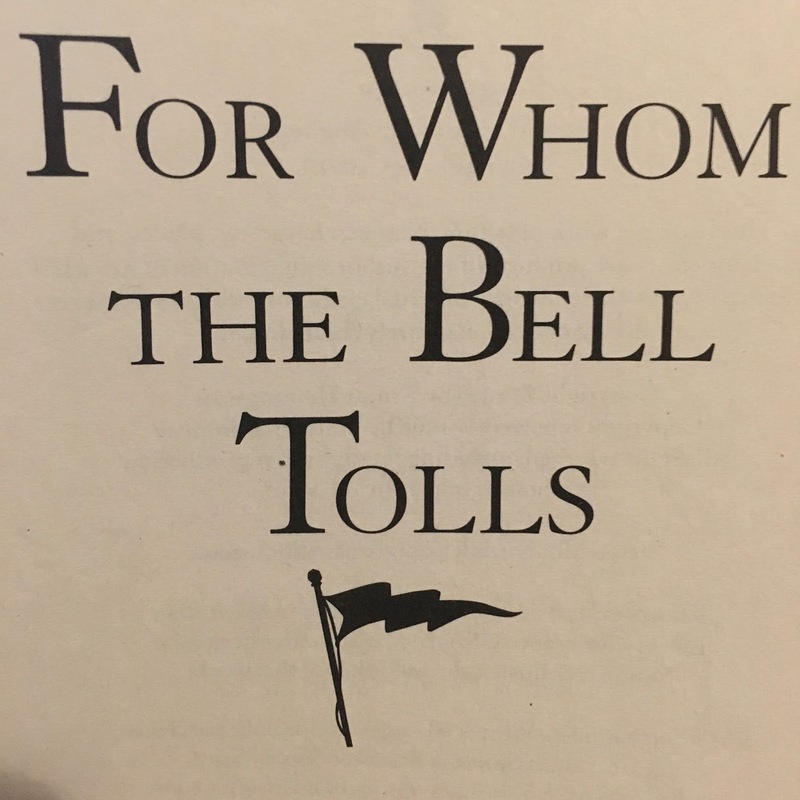 So when I reread books, it's not to remember the story so much as to see how differently I interpret it based on where I am in life now versus where I was when I read it before. It's not that I get to the end and realize, "Oh, I completely missed the point of that," (though that's happened at least once). It's more a matter of emphasis and how different parts of the story stand out to me, or maybe more accurately, how I relate to the way the characters experience the story. 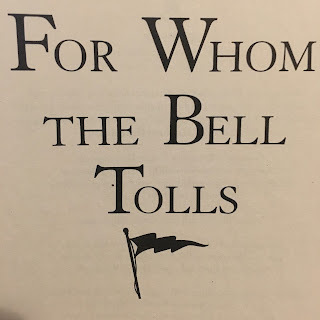 I read For Whom the Bell Tolls for the first time one summer five years ago, and began my first rereading of it earlier this month. I had remembered it having a great effect on me the first time, and also spent the half decade since then going around telling people that it tied for first place as my favorite book ever. Thus, I was a little bit nervous that on rereading it I would find that I either a) completely missed the point of it the first time, or b) didn't really care for it all that much. Thankfully, neither of those was the case: It still seemed to me to be about suffering as the unifying part of the whole human condition and the inevitability of our own fates, and I'd still say it's one of my favorite books ever. How I related to the story, though, was another matter. The first time I read it, the things that affected me the most were the great sadness of all of the death that happens in it, and the passion of the relationship at its center. I'd recently lost a friend, so maybe that explains some of it. Not knowing what was going to happen the first time may have also played a part. Beyond that, I remember being impressed with what a badass Robert Jordan was. With his flask of absinthe and his backpacks full of dynamite, sleeping with Maria just hours after meeting her and leading guerrilla attacks on a fascist army. He represented a lot of things that my 22 year old self wished I could be. Reading it this second time, the things that really affected me were different. They were more subtle, but just as profound because I'd actually lived them. Having to finish a job in spite of unforeseeable complications that arise. The tension of being an outsider and a foreigner working alongside people who will never really understand or trust your motives for being there. Being caught up in a fight to the death over an abstract political cause that you sometimes aren't sure you even believe in. The necessity of action even in the midst of deep contemplation. I also found that this time I admired the old hunter Anselmo. It may just be I forgot, but I have no recollection of seeing him as more than a tertiary supporting character before. Something about his steadfastness—often mistaken as simplicity—and his own conflict between his love for the Republic and his old religious faith and hatred of violence struck me in a way I don't remember at all before. I hope I haven't aged that much in the last five years that my favorite character is now the elderly man. But then, maybe I'm looking up to him with respect the way I looked at Robert Jordan the first time. At any rate, it was good to revisit the book. I intend to do it with a number of others now, and will have to remember to circle back to this one in another five years or so. That is unless I've tragically died by then, in which case you will have to read it for both of us. loved to see your lovely thoughts and wonderful books you have shared, i really like your blog and will add in my bookmark,keep posting, have a nive day.